Cleaning is rather difficult in regular spices grind. Uncooked rice can be a nice way. Coffee connoisseurs will find this versatile grinder great for both coffee and spices. If are not so much finical for your coffee, your choice to use this grinder is right. You will not find blade grinders as good as burr grinders but this Krups grinder serves you with good quality than other blade grinders. Versatility, inexpensive and with small footprint on your countertop, Krups coffee and spice grinder is indeed an admirable one. 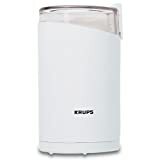 Krups f2037051 brings to you altogether an exclusive feature – both coffee grind and spices or even whole grain grind! The stainless steel blade makes it secure for long lasting even if you use it for nuts, spices or whole grinds. This versatile anywhere portable grinder is much fitting to your kitchen counter for its beautiful small footprint. Details of these overall features will lead you know more of this coffee grinder. So have a look to them how really they good from this krups f203 review. 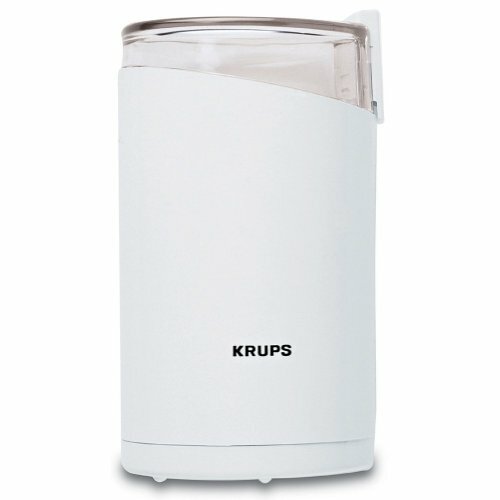 Why krups coffee and spice grinder is called a versatile grinder? Notice its name. Yes, multiple tasks you can do with this krups grinder. You will give the value to a blade grinder in comparison with a burr grinder in the case that a blade grinder is capable to chop almost everything. No difference with Krups blade grinder, the same work does, grinds fine on medium order and excellent with any kind of coffee except you are most fastidious in your coffee style. It is also expert in slicing any spices like herbs, nuts or seeds that is good for chopping any kind of hard things. Stainless steel blades are hardy and give long lifetime guaranty. Actually krups coffee grinder shows its bold feature introducing an oval shaped blade design that gives you uniform grind. The main advantage of a blade grinder that i said before is you can grind anything with it. And stainless steel blades are more advanced in it just not only for grind but consistent grind. Now grind is easy with dry seeds, hard nuts and other spices with this excellent stainless steel blade. Though krups coffee and spice grinder is small in size, it can hold a good amount of coffee grind. It will not let you fall in trouble to grind around 12 cup worth- so nice and good capacity it has! So all time feel comfortable to grind for full of guys or only for you. This will easily serve you a single cup or full pot up to 12 cups. Some customers claim it last more than 10 years,some are using for 2/3 years without any problem. In fact it depends how much you use it in a day. Not so hard. Clean with a wet cloth and brush. Don’t sink them into water but you can wash lid easily in the sink. Some raw rice grind may your cleaning more easy. Which power supply it supports? This Krups machine is 120v. It will not support 220v but will work with power convertor. Can it grind walnut or almond? Yes, it is. Some customers say that dry almonds do very good grind almost into a powder.